Useful resources when you are on the move. 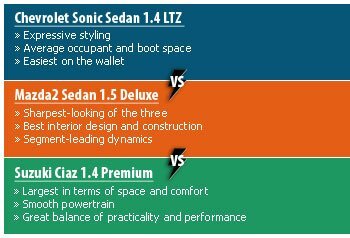 We put Suzuki's new sporty compact sedan, the Ciaz, against entrants like the quirky Chevrolet Sonic Sedan and charming Mazda2 Sedan. In an era where crossovers and Sport Utility Vehicles (SUV) dominate the roads and constantly top sales charts, it's easy to neglect the motoring staple that is the compact sedan. Though small, these bread and butter mobiles are reasonably sized for a small family, fuel efficient and value for money. With the technological arms race happening around us today, compact sedans are no longer the mundane boxes on wheels they used to be. Whatever your motoring needs may be, you can bet that there is a compact sedan in the market that will fulfill them. Here then, are three examples that make interesting choices, the Chevrolet Sonic Sedan 1.4 LTZ, the Mazda2 Sedan 1.5 Deluxe and the new kid on the block, the Suzuki Ciaz 1.4 Premium. Will Suzuki relive the glory of the Swift with this new compact sedan? Unlike the tamer-looking Mazda2 and Ciaz, the Sonic's playful and anarchistic styling, thanks to its aggressive front snout and somewhat angry-looking headlamps, will tug at the heartstring of younger buyers. But that doesn't mean that its Japanese competition loses out in this respect as well. This may have been said many times over, but probably for good reasons. Mazda's 'KODO: Soul Of Motion' design philosophy is, in our opinion, the best thing the marque has come up with since the RX-7. 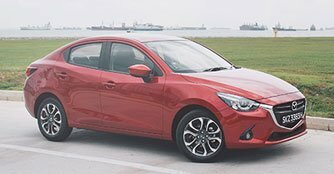 The Mazda2's sharp and suave demeanour is evergreen, and it won't have a problem appealing to buyers of all ages and all walks of life. Looks are subject to individuality but with regards to beauty, the Mazda2 is the apple of our eyes. The Ciaz, on the other hand, isn't as strikingly flavourful as the Sonic or Mazda2, even with the RS aero kit that comes with the car. 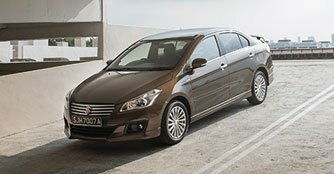 But simplicity is customarily the key with these compact sedans and the Ciaz's down-to-earth presence does a good job in working to its favour.